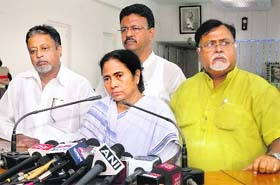 If Trinamool Congress (TMC) chief Mamata Banerjee had her say yesterday with her decision to pull out from the UPA government, the ruling coalition had its way today when it categorically rejected its estranged ally�s demand for a rollback on diesel price hike, cap on subsidised LPG cylinders and FDI in multi-brand retail. West Bengal Chief Minister and Trinamool Congress supremo Mamata Banerjee interacts with the media in Kolkata on Wednesday. Despite talking tough and ruling out of a rollback of its market-friendly reforms, the government on Wednesday appeared softening its stand as a large part of the country braced for a strike against foreign companies entering multi-brand retail trade and the hike in diesel prices. Army Chief General Bikram Singh today contradicted Beijing�s claims that no soldier of the People Liberation Army (PLA) was in Pakistan-occupied Kashmir (PoK) saying Chinese troops were present there. The Supreme Court today observed that it was the responsibility of the nation and the government to provide flats to all those rendered homeless in the 1984 anti-Sikh riots. 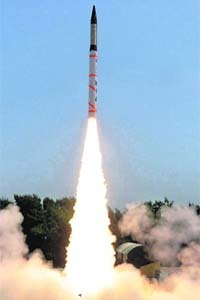 The missile was test-fired from a road mobile launcher from complex-4 of the Integrated Test Range at Wheeler Island, about 100 km from Balasore in Odisha, around 11.35 am on Wednesday. The trial was successful and the missile reached the target in 20 minutes. The Ministry of Home Affairs (Foreigners Division) has ceased the Indian citizenship of senior Congress leader and transporter Avtar Henry. Burmese pro-democracy icon Aung San Suu Kyi wants the US to ease remaining sanctions on her country. �I do support the easing of sanctions because I think that our people should start taking responsibility for their own destiny,� Suu Kyi said at the US Institute of Peace on Tuesday. 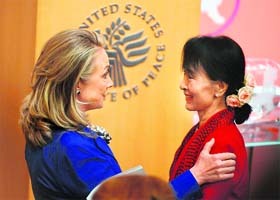 US Secretary of State Hillary Clinton with Myanmar's democracy icon Aung San Suu Kyi in Washington. Around three decades after it was labelled a �disturbed area�, Chandigarh today finally managed to shrug off the tag, with the Punjab and Haryana High Court quashing a notification to that effect.